Fans watching football from the stands see the star players scoring touchdowns, running over defenders, and making big plays. The skill position players are always getting the fame and glory. They are the ones putting points up on the board and making big plays happen. But what about the players on the field or sidelines that aren’t making the big plays? Those players are blocking for the running backs and allowing enough time for the quarterback to get a pass off to his receivers. These players are very important to the team but often don’t get credit for the work they do on the line. Some of the unsung positions include the players on the offensive line, some of whom are pictured above. Junior Nate Stock (#24), senior Jesse Van Wyk (#54), and senior Aaron Van De Krol (#76) are among those blocking for senior Sage Zylstra (#40) as he receives a pass in a game last fall. The offensive line is one of the most overlooked positions in the game today. I say this not because I spend some of my time on the line, but because I know the guys on the line put a lot of work in the off-season preparing to go up against our opponent’s biggest, strongest guys. 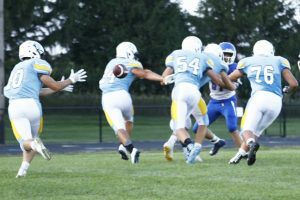 The line has a huge responsibility during games to protect their team’s skill position players like the wide receivers, running backs, and quarterbacks. This got me thinking about other people who don’t get the credit they deserve. Another role commonly overlooked are the coaching positions. You always see the head coach, defensive coordinator, and offensive coordinator, but what about the assistant coaches? The assistant coaches are always at practice and always at games, just like any other coach on the team. Each coach has a specific role on the team, whether it’s helping with the quarterbacks, the linebackers, or the kickers. They all are putting serious hours in during the day and on the practice field, but all of them might not get the attention they deserve when it comes to game time and success. The coaches watch hours and hours of film, and to be honest, I have no clue how they do it. They all have jobs and families to maintain as well as their football family. One of the biggest unseen roles in high school football is the scout team, or practice squad. This is the group of guys that goes up against the varsity starters. They have to come out to practice every day with the mentality they are just as good and can make plays against the first-team players. These are the players that give the varsity a good look the week before a game on how the opponent runs their offense, defense, and special teams. This is the most important part of a football team, and without a scout team, there would be no way the varsity could get ready for the game ahead of them. The role of the managers goes deeper than what most people see. Yes, they are on the sidelines of football games giving out water, keeping track of the kicking tees, and videotaping the games, but there is a lot more work they put in behind the scenes. The work they put in is often on their own time in addition to practice hours and game time. They are in charge of getting the medical kit out and to the practice field every day, keeping the water cold, helping the coaches, getting uniforms ready for games, and bringing stuff out to the practice field and putting it away after practice has ended. These unseen people play a big part in more than just sports. Those people are everywhere you go. These people can be found at workplaces, homes, churches, and other school activities. A lot of people put extra time and effort into doing their job the right way without getting recognition for it. These are the kind of people that keep things going and don’t let others down by committing themselves to their work and not doing it for themselves, but for others.